Looking for a kitchen upgrade that doesn’t require contractors, a home equity loan or doing dishes on your front lawn? We get it. Sometimes you just need a little update, a creative outlet, or a quick sprucing. If your time is limited and your budget is in the single digits here’s a great afternoon project. 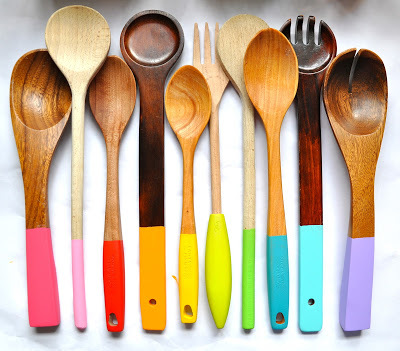 Add a little color to your kitchen with painted kitchen utensils! These are so fun to create and even more fun when you get to use them every single day. Take a drab spatula and make it something unique. 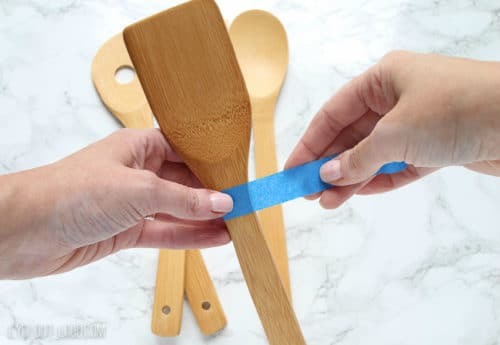 Create custom utensils from the cheap section at Walmart and no worries if you make a mistake or hate the color, because you can always paint over it later. First, pull out all the utensils that need an update. Plasticware doesn’t tend to accept paint as well, wood utensils work better. 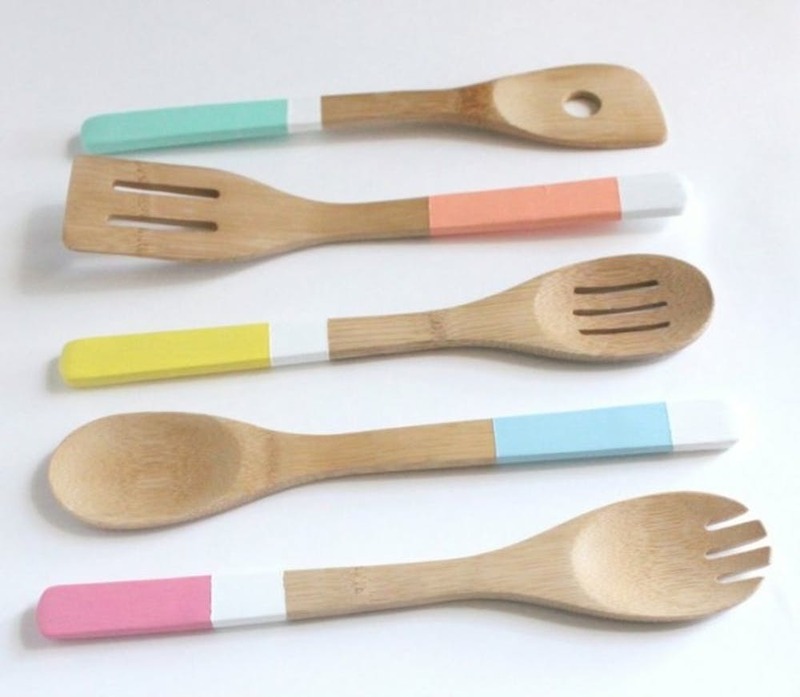 You can also purchase new wooden utensils almost anywhere. Next, decide on a pattern or color. Honestly this is the hardest part. There are so many cute options. You can do Ombre or polka dot. Classy black and white or funky rainbow theme. Whatever your style, there’s a paint option to match. When you have your utensils and paint ready to do, use painter’s tape to tape off the section you don’t want painted. These look best with a clean line to separate the bright color from the natural wood. You can paint the whole handle, or just a portion – there are no rules here. Now it’s time to get creative. The options are literally limitless. 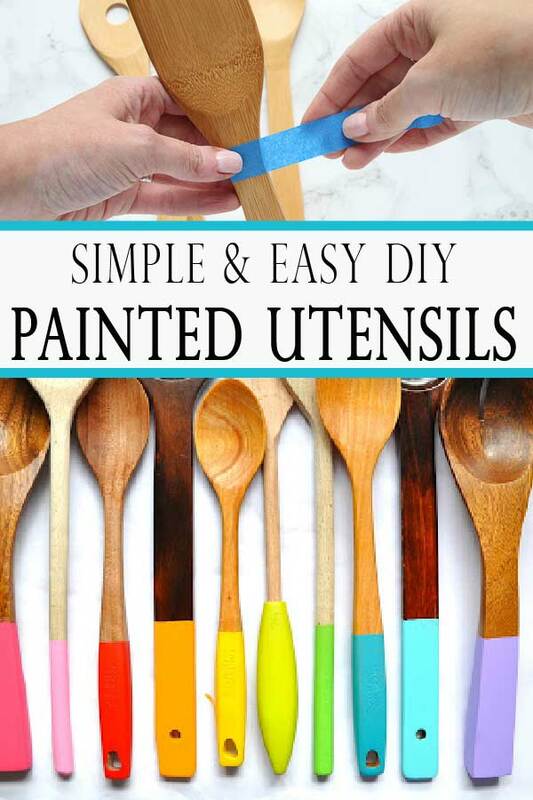 You can choose to dip the utensils in the paint, or use a brush instead. Anything goes! 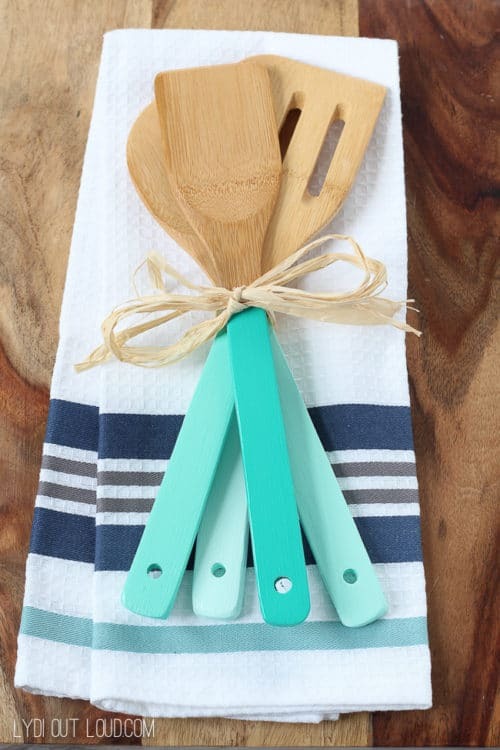 These utensils were dipped in white first, allowed to dry completely and then dipped in a bright color for a cute and modern double-dipped look. No need to limit yourself to just utensils, wooden cutting boards can be painted to match as well. This set makes my Kate Spade loving heart happy. It just looks so clean and classy, I can’t stop staring. Of course, you don’t have to stop at paint, adding glitter always makes a good thing even better. This would make perfect gifts or favors as well. 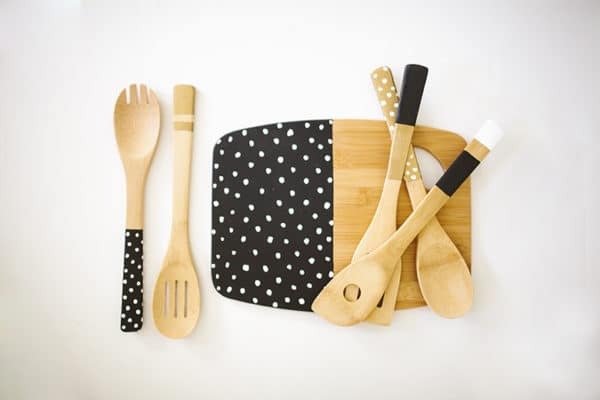 Having cute utensils is a great way to spruce up the kitchen and add your own personal style to the space. But they also make great gift ideas. It’s an inexpensive gift that is custom and thoughtful. Perfect for your next bridal shower, birthday, or hostess gift.